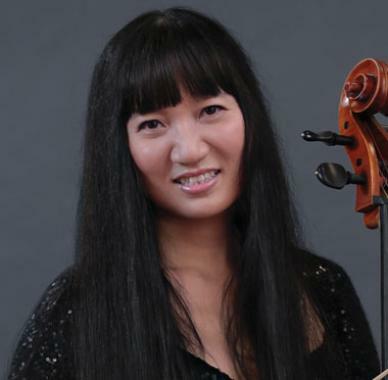 A native of Beijing, China, Xiaomu Fang began cello studies at the age of eight. She received her formal training at the Central Conservatory of Music in China and was awarded top prizes in the Bach Suite Competition, the Chinese Works Competition and the Solo Competition of the Central Conservatory of Music. In 1996, Xiaomu moved to the United States and studied with Eleonore Schoenfeld at the University of Southern California on full scholarship. Since moving to the States, she has been a First-Prize Winner of numerous competitions, including the Pasadena Instrumental Solo Competition, Young Musician Foundation’s 42nd Annual Solo Competition, the Chinese American National Showcase Solo Competition, the University of Southern California Concerto Competition, the American String Teachers’ Association Solo Competition, and the Brentwood-Westwood Orchestra Solo Competition. As a winner for three consecutive years, Xiaomu received the highest Fellowship Grants Awards from the Los Angeles Philharmonic’s Excellence in Diversity Program from 1996-1999. She was also awarded First-Prize in the Mu Phi Epsilon International Fraternity Scholarship and Sigma Alpha Iota Scholarship Awards. Xiaomu has performed as soloist with the China Philharmonic Orchestra, the Pacific Symphony Orchestra, Young Musician’s Foundation Debut Orchestra, the Brentwood-Westwood Orchestra, and the USC Symphony under the baton of guest-conductor Segiu Comissiona. In 2000, Xiaomu was invited as one of the 35 outstanding cellists from all over the world to participate in the master classes and concert series of the World Cello Congress III. In the same year she was chosen to participate in the New York String Orchestra Seminar, including two concerts at Carnegie Hall. In 2002, Xiaomu was the First-Prize winner of the Five Towns Music String Competition in New York, and was also a winner of the Olga Koussevitzky Competition for Strings. During the same year she was the Cello Award winner of the Artists International Presentation’s 30th Annual Award Competition, which resulted in her New York recital début at Carnegie Hall’s Weill Recital Hall in May 2003, receiving great critical acclaim. Xiaomu studied with Harvey Shapiro at The Juilliard School on full scholarship and graduated in 2003. She was the Principal Cellist of both The Juilliard Symphony and The Juilliard Opera Orchestra. An active chamber musician she performs frequently at the Lincoln Center in New York with her piano trio and string quartet. From 2005-2007 Xiaomu was the Principal Assistant Cellist of the China Philharmonic Orchestra, and performed the Concerto Grosso for Three Violoncelli by Krzystof Penderecki with the orchestra in December 2006 to great acclaim. In April 2007 Xiaomu was invited to play a solo recital at Lincoln Center’s Alice Tully Hall in New York, winning again the highest acclaim from both the audience and the press. For her extraordinary talent and contribution to the world of music, the New York State Assembly of the United States awarded Xiaomu the “Outstanding Achievement in Arts and Culture Award” in April 2007. She was the first Asian musician to receive this award. Xiaomu joined the Hong Kong Philharmonic in 2008 as the Co-Principal Cello. She was invited to play another solo recital at the distinguished Carnegie Hall’s Zankel Hall in New York in April, 2008. After a highly acclaimed performance, she was immediately invited back to play another solo recital at the new Alice Tully Hall at the Lincoln Center in New York.